Have you seen Gracie's twin at your local Old Navy? I wonder if they saw a picture of my sweet girl and thought she'd make a cute mannequin. Or perhaps I need to get my kid into modeling, if this is what companies are looking for. 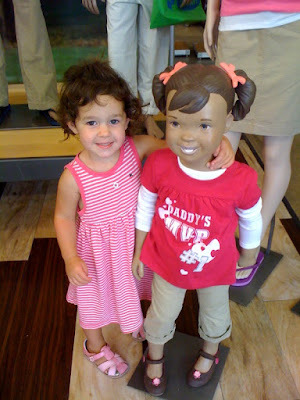 Gracie found her twin at the front of the Old Navy store and was instantly smitten. Hugging her and caressing her face (as you can see by the gentle cupping of the neck). Personally, I think Gracie is cuter. But I'm biased of course. Hey Old Navy, anytime you want to borrow my daughter, let me know! Her college fund could use a boost.